Sustainable Personal Finance celebrated it’s 6 month anniversary over the Canadian “May 2-4” (Victoria Day) long weekend just a few days ago. Over the past 6 months we have explored a lot of sustainability topics while mixing in financial analysis in articles about dog food, giving to charity, home renovations and how to save gas by leaving the car at home. Now that our feet are “wet” so to speak we will begin to explore more traditional personal finance topics in addition to our sustainability / green / eco articles. To kick it all off I am going to present Our Sustainable Personal Financial Plan – the approach Mrs. SPF and I have determined to be the best plan of action that we believe will secure our financial present and future. This article will be split into two parts: The Base and The Future. Our Base will look at the core of our personal financial plan and Our Future will outline the steps we are taking to (hopefully) prosper in the future. Our goal is not to retire by age 45 (although Mrs. SPF is 9 years younger than I so she may be able to!) and we do not strive to deprive ourselves of all things enjoyable to ensure early retirement. We want to enjoy what life can provide at all life stages and as such we like to think our plan is sustainable: for us. Last summer when Mrs. SPF and I were buying a home together for the first time we discussed why we valued owning property of our own. There are a lot of arguments for and against home ownership and we are well versed on both sides. Ultimately we view our house as not only a stable investment that will appreciate over time it also provides us a place to raise a family and call home for the next 2-3 decades. As such, we include home ownership as part of our personal financial plan. Home ownership won’t be the right fit for everyone but it works well for us. We knew we’d pay off the mortgage aggressively (currently we pay 40% more every 2 weeks than we are required to), in fact, while we were getting financed for a 25 year amortization we would have the mortgage paid off in less than 10 years (closer to 8). This means that once the property was paid for we would have greatly reduced housing expenses. Compare this with the idea of renting for the next 50-60 years – the savings were obvious. In addition, aggressive payment of our mortgage enables us to invest more rapidly and allow the wonders of compounding to work for us. More on this Tuesday of next week when I discuss our investment choices. Our house allows us to save gas as we can walk to work. It will serve as a steady homestead for our children to grow up in and attach fond memories to. People in this 100 year old neighbourhood tend to live here for decades so our kids will likely have long time child hood friends and classmates. These sorts of features are difficult to assign financial value to but the value is there in different ways. Our family has been looking at succession planning of recreational property, a cottage north of Kingston, Ontario. I recently wrote a guest post on the topic: Children and Capital Gain in Cottage Country which explores the options cottage owners and their kids have regarding dealing with capital gains tax. In our situation we need to determine if and when to “buy in” on the property with my Dad and Sister. Our net worth would increase if we bought in but we’d also incur annual expenses. The travel to get to our cottage (one of 3 on an island) is a bit arduous – 3 hours and an additional hour or so come October it will take an extra hour to canoe back to main land for a 2nd load of baby gear. We also need to find time to get to the cottage – I think we’ll only get there once this summer, maybe twice. We are adults now and likely should contribute more to the family property. We will continue this cost / benefit analysis throughout the year and make a decision on this item in our personal financial plan. Once we get these debts paid off we will free up that monthly payment to put toward our investing efforts and/or our mortgage elimination. We are torn between paying off the higher rate, larger debt in our Canadian student loan versus (quickly) paying off the smaller debt with the lower interest rate in the Ontario portion of the loan. Mrs. SPF and I both work for the same employer, a government agency in Peterborough Ontario. Our employer offers a defined benefits pension which we both pay into every 2 weeks. Our employer matches our mandatory contribution so when we retire we will be afforded a pension that will be the basis of our retirement funds. Our pension is commonly referred to as a “gold plated pension”. We are extremely fortunate to have government defined pension plans which will pay us 60%-70% of our 5 highest years of salary once we have worked a number of years of public service. The plan forces us to save money and this investment is partially tax deductible and greatly enhances our portfolio returns. Less than one in three Canadians has a Defined Benefits Pension and many of those individuals are already retired. Since these plans are very expensive many companies no longer fund them. The Defined Benefits Pension plan is a stalwart in our personal financial plan but we are not relying on it entirely as many things can change over the next 2 to 3 decades. Both Mrs. SPF and I are covered by both disability and life insurance by our employer. Insurance is very important to us especially as we have lil’ SPF on the way. If anything were to happen to one or both of us we want to make sure our income remains, albeit at a smaller number, if we were to become disabled. Additionally, we get the equivalent of 1 year salary in life insurance from our employer. This is not nearly enough to cover our debts already discussed so we have supplementary life insurance via a 3rd party that will fully cover our mortgage, student debt and funeral expenses. We likely purchased a bit too much insurance given the work life insurance we have, but if we were to lose 1/2 our income our investing and long term goals would be harder to meet as we’d lose a large chunk of income. So this money could be used to continue the previous goals. Thanks to Mike @ Money Smarts Blog for pointing out i’d forgotten insurance in “The Core” part of our personal financial plan. In the next article regarding the future of our personal financial plan we will discuss things like our investing strategy and things like looking at a RESP for our kids, giving to charity , emergency funds and more. What are your thoughts on part 1 of 2 of our Personal Financial Plan? Are there areas you would do things differently? I felt like I was reading my own story. Boy are we a lot a like. My hubby and I are on the same kind of plan. We are currently debt free apart from our mortgage so paying that off and investing for our retirement are our top priorities. We are also trying to get some renovations finished off on the house. We too have defined benefit pensions for our jobs and yes they are a rarity. We pay into it every two weeks and we also get an employer match. If we retire when we hit our “magic 80” I will be 51 I think which to me is a nice age to retire. I might still work part time or something, we’ll see. I have to fund that travel habit I have. Since my husbands parents live in the country and 10 minutes from a lake we don’t have a huge desire to buy a cottage. Between my parents wealth and his parents wealth, we will have a lot to look after as it is. If anything we might upgrade to a bigger house down the road. I think you two are on a great track and will enjoy the benefits of having a solid plan like this for years to come. Renos never seem to end Miss T! And they always cost money. We will have some pretty big renos down the line. Our kitchen is tiny and the previous owners turned a once massive kitchen into a dining room best I can tell. We plan to turn the (now) small kitchen into a pantry and revert things back someday but that will cost a lot. We also have about 900 sq ft of unfinished space in the attic we will finish as either an office / play space or an office / master suite. But we plan to stay in this house for decades. You are lucky w/ your DBP. Ours is “factor 90” so i’m in the job ’til i’m 58 if I want FULL pension. That being said, if we have enough to live well on we may not go for “full” pension. But we have a few decades to figure that out. Watch for part 2 when we discuss our investing strategy, RRSP, RESP, TFSA, charity and home retrofits as the other side of our personal financial plan! This sounds similar to where I’d like to be in a few years – I currently have a defined benefit plan that I will be able to take advantage of at retirement, as well as other retirement assets that I’m saving on my own. I’d also like to get a vacation cabin or something similar somewhere, I just havent decided where yet – I’d like it to be a vacation cabin/home for a while, and then turn into the place where I’ll spend my retirement (possibly). I do know that I’d like it to come with some land (as they aren’t making land anymore) but I’m not sure how much – as you all know the “dream” here is 40 acres, but I’d take more than that (or less) depending on where it’s located and what I can raise/grow on it. I also think It would be a great place for family holidays. All of that stuff, of course, is a few years out – I’d like to get my debt paid first, and before that I need to make it through this summer! I’m sure you’ll get there Jeff. Our cabin is on a small island and given Canadian winters it could never be used as a year round place. First, it is SMALL (as in TINY home small). Has no indoor bathroom and all the water we use is pumped from the lake. This doesn’t work too well once the lake freezes. Until it freezes you can’t get back and forth to the mainland which makes getting supplies a problem. Third, no insulation – so it burns a LOT of wood in late fall or late winter when we go up. And last, it’s only 1/2 acre so there aren’t a lot of trees to use for fuel. But it is nice in the summer. I think you’re a few years behind me in age but perhaps a few ahead of Mrs. SPF. At your age I was not close to where we’re at now. Having an employed partner with a good job certainly does help the personal financial planning. Very smart. You are on a great path to pay off your mortgage so agressively. It gives tremendous life flexibility. Is that your adorable home? I like it! Yes, that is our house, and our family cabin as well (which is now a dark moss green colour, not baby blue). We do love the 100 year old houses having grown up in Kingston ON and Montreal QC – the entrance to North America sooo many years ago. I would be hesistent to buy into the cottage. If you aren’t using it much, it’s probably not worthwhile. 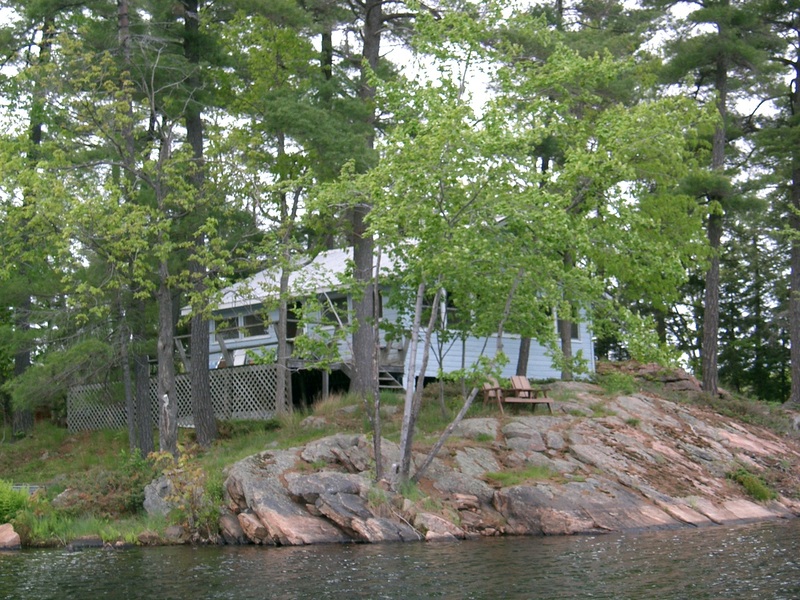 You can easily rent a cottage for the one or two weeks you need it. Maybe you can rent that one from your Dad & Sister? What about insurance? I’m assuming you have disability insurance from your employer, but what about life? Thanks Mike – good points. I should have included life insurance in with “The Core” – we do have it and i’ll add it to the next article in this series. Then perhaps move it here long term. Or just add it tonight to this article – very important to have. We do have disability via our employer and 1 full year salary for life but we have coverage above and beyond that … to be explained! Forgot to mention – that cottage looks pretty close to the water. I found that taking my kid/kids to my parents’ cottage was very stressful for a year or two once they got mobile. Plus the cottage probably isn’t child proof so that is even more hassle. Once they get a bit older (3+) it gets a bit easier for that stuff. All very valid points, as usual. Given the distance we COULD rent closer to us, and, potentially work out an arrangement where we use the family cottage for a week in the summer in exchange for my going up in the fall and closing the place down for winter. It is close to the water and child-proofing is a concern. It is great for kids 8 yrs + I think – that’s when my sister started going there. But even the deck needs work as it is a 7 ft drop unless the spaces under the seats are cut off (we’re considering lattice) + we’d need to build gates on the 2 stairways. The property is one big rock with lots of places to slip and fall. I do see how helping w/ costs would help out with the bills. I was the one driving the sharing so if I back out i’m not sure it will move forward at all and the capital gain will be dealt with many years out. It is a hard decision for certain. I think you’ll really enjoy your homeownership experience. Congrats! 6 months and we’re still hard at it! This is my 2nd home but the first Mrs. SPF and I bought together. I’ve owned for almost 6 years now. Check out our Housing category for much more on the 6 article bit I wrote about staging tips, our 3 parts staging experience, selling a house and buying a home. Some of our more popular articles. The tweetmeme button stopped working for me. Do you not see the DiggDigg bar to the left of the article? You are off to such a great start. I too started off with student loans, and they drove me crazy. You will be so happy when they are gone. I found it hard to figure out how to balance investing while paying a mortgage and student loans. It can be hard to decide where to put your money for maximum return vs. psychological benefit. Congratulations on your continued success. I think you are on a truly sustainable financial path! Such a great plan to pay off the mortgage aggressively as it is amazing when you see it written down on paper just how much longer you will be paying off that mortgage! Sounds like a great plan. Don’t you love how most sustainable things are also frugal? That’s one of the main drivers of our site! We like to show, in a non-preachy way, that being sustainable / green can equate to being frugal / financially responsible. Most of our big renos are done with the exception of some flooring and the yard. Otherwise just small projects. I am jealous of your 900 square feet of extra space. What I would do with that room…lol. Yes we are pretty lucky with the magic 80 thing. It is a combination of our age and years of service. I am looking forward to the other parts of your series. We used to have the “factor 80” but it was taken away a few bargaining sessions ago and turned into factor 90. It seems schools, public service and the medical field have been slowly altering the perks in the DBPs over time. I prefer tweeks to elimination! The best thing for us is we aren’t unionized. I don’t have to pay dues for things that really aren’t helpful. I used to be in previous jobs and I must admit being out of scope has worked better. I have been able to negotiate a better salary and I save on dues. The benefits and pension are the same. Pros and cons of course. On a whim non-union can take away the benefits, pension and fire people. With union you get a lot of slackers but more security. Your mortgage payment play is very aggressive. It would be great to own the place outright so you don’t have to worry about payment anymore. The cottage is in our family. We’d gain net worth but have added expense. We plan to increase our mortgage payment by another 20% at the start of 2012 and may even put a lump sum down this year – though the student loans make sense to eliminate first given they are much higher rates, and variable, than is our mortgage. First, I admire where you are with your financial base and want to say great job. I truly wish we’d been educated better growing up and we are currently working to change our financial future. I am anything but an expert but I did have to ask: how does it benefit you to pay your mortgage so aggressively while you still have the student loans? Wouldn’t it be better to pay the required amount on the mortgage for six months, a year, whatever it might take and put ALL that extra towards the student loans? Then, everything extra plus the student loan money could go towards the mortgage. I would think this would leave your home and loans paid off in less total time. Thanks for visiting our site Tammy! Our student loans are about 18x less than our mortgage …. We’re close to finishing them off whereas we are easily a decade away from the mortgage. Also, our student loans are a higher interest rate than the mortgage. Now, here in Canada student loan interest can be partially written off @ tax time but our mortgage interest can not be written off – at all! So it is close, but we feel it is better to get rid of the loans, free up that ~$290 per month and apply that money against the much larger mortgage. And our post Tuesday of next week will show how having more mortgage paid helps us as well. I wish that all people in your age bracket worked as hard at planning their finances. I think you have your hands full advising your age group, concerned about mortgages, life insurance and having babies. Has anyone launched a Sustainable Personal Finance site for 16-21-year olds – the ones who get suckered into piling up huge debts on multiple credit cards? There are actually a few sites out there for people in their 20s (and younger). The difficulty is getting people in those age brackets to look into the subject matter before they get into trouble. As a 60 something my advice on the family get away. Don’t do it. We all find that we never have time for it etc.. Instead make generous gifts to your families extremely generous gifts and use it as time permits. We bought with our family years ago we basically tote the entire bill now we have not been to or seen the property in almost 7 years. It is not sellable and we are not at all sure what to do about it. All the others have since passed on and we only spent two days there 7 years ago. So now it is just a major headache for us and we need the money we keep throwing at the money pit for other things. Thanks for the insight Jan.
We’re about 2.5 hrs away from the cottage – but, since it is an island, I can add another hour of hauling the baby + gear + Newf + Mrs. SPF the 15 mins it takes to paddle there, then unload everything, get it up to the building then back in the canoe! 15 mins (assuming low winds) back to the car to get the rest of the gear and solo back. A long haul for me to just get to the cottage. Then I repeat on the way home. My Dad and Sister are much closer to the cottage and get much more use out of it than we do. They go up for weeks at a time and most weekends it is booked. I’ll get there 2 times this year – once w/ Mrs. SPF (baby isn’t here yet) and once with some pals for one guys bachelors weekend. I am considering offering my Dad $50 per 2 days of being there to help cover expenses, so $50 a weekend of $200 if we get there for a week at some point. The fact remains that we simply don’t use 1/3 of the power or facilities. Well, you are on a huge trail to pay off your mortgage so insistently. It gives wonderful life suppleness. Pingback: Retirement Income Planning: Where will your retirement income come from?